Transform any room with our Star Light Backdrops. White twinkle lights have different settings from static, twinkle & various programs to match your taste. Our backdrops are used behind the Head Table at Weddings but has been used at many different types of Events. It will cover unsightly walls & offer the perfect visual setting for your professional pictures of the speeches & the wedding breakfast. 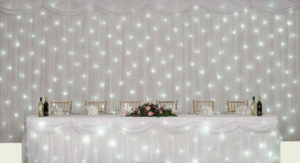 The Star Light Backdrop really does frame the head table creating a beautiful backdrop which is visually pleasing for all. These extra touches will really add to the Event & are an extremely cost effective way in making a big difference to your overall Wedding Breakfast Styling. Also available is the perfect Star Light Table Skirt suitable for any top table, this simply attaches to the table to create a stunning starlight effect. The table skirt works well with our starlight backdrops to completely transform the appearance of the event. Add uplighters to your Backdrop package for only £50 for 5. They look amazing as the evening comes around and the daylight starts to fade. Or even better you could consider uplighting your whole room to really make a statement. When we researched which backdrop to buy there was many to choose from. 95% were the cheap LED ones you often see on the Facebook groups. But after visiting a few suppliers & seeing the poor quality flimsy material they use I opted for Mirage Back Drops which are made in the UK & used by all the professional rental/marquee companies. Heavy luxury material using the best fibre optic lighting to give a more natural looking twinkle. It cost four times more to buy this back drop but the proof is in the pudding which for your Event is a high quality back drop & runners we provide. If you see a back drop that is much cheaper then I would guarantee it’s not a Mirage Fibre Optic Back Drop made in the UK to this high quality. More likely you will be getting a cheap Chinese LED netting that can look similar on screen with a clever picture but when in front of you the quality is very cheap.